Each year, we build a budget that balances setting a reasonable tax rate and delivering services expected by residents and businesses. To take a look inside previous years' budgets, check out that year's Financial Plan. Kelowna City Council approved the final 2018 Financial Plan, with a municipal tax increase of 2.99 per cent – the lowest it has been since 2014. The 0.61 per cent reduction since Provisional Budget in December is a result of debt interest rate resets and increased revenue from the FortisBC Gas Franchise Fee and City investments. The reduction has been partially offset by nine additional items Council approved on Monday. The 2018 Budget prioritizes safety with a total of 20 frontline safety personnel being added this year – this includes four bylaw officers added at Final Budget for ongoing safety in the downtown area. At Council’s direction, Final Budget also includes the development of Phase 3 of Rutland Centennial Park to expand the playground, infrastructure and irrigation for the park. Through strong financial management, taxation for the City of Kelowna’s 2018 Budget accounts for 26 per cent of the City’s total revenue needed to deliver services to residents. Other revenue sources come from grants, reserve funds and fees and charges. Council sets the tax rate requirement after reviewing the Financial Plan to determine which projects to fund and which projects to defer or cancel, balancing the community’s interest in maintaining existing levels of services while planning for significant infrastructure needs. For 17 years, the City has received the annual Distinguished Budget Presentation Award, and most recently for the 2018 Budget. Presented by the Government Finance Officers Association, the award recognizes the City’s achievement in meeting the highest principles of governmental budgeting. For more information, review the 2018 Financial Plan that includes Council's changes to Provisional - volume 1 on Dec. 14, 2017, and the Carryover - volume 2 document reviewed and adopted by Council on March 19, 2018. Final budget was presented to Council for review/adoption on April 30, 2018. Every year presents its unique budget challenges and difficult decisions. The 2017 budget is about supporting core City services affected by population growth, finding innovative ways to reduce costs and constantly improving City services. This year’s proposed 3.84 per cent taxation increase is necessary to meet previous years’ commitments and provide the resources or funding needed to keep up with our growing population, including our homeless population. For more information, review the 2017 Financial Plan that includes Council's changes to Provisional - volume 1 on December 15, 2016, and the Carryover - volume 2 document reviewed and adopted by Council on March 13, 2017. Final budget was presented to Council for review/adoption on May 1, 2017. As an innovative City, we are agile enough to adapt when new and growing issues arise, such as homelessness. Homelessness has intensified as a concern in cities across the country in recent years, and Kelowna is no exception. It requires a focused response from all levels of government, including the local level. Developing a balanced strategy to address homelessness in Kelowna, such as adding enforcement and support staff, will be an ongoing focus of City budgets. As financial and staff resources are diverted to address homelessness, other City services may receive less funding to minimize the tax demand. Community safety continues to be a significant part of the City’s budget, with requests brought forward for two new RCMP members, ongoing RCMP contract costs, continued work on the Police Services Building, Glenmore Firehall upgrades, needle sterilization and disposal, a safety coordinator and the Homelessness Strategy term position. Every year presents its own budget challenges and difficult decisions. This year, the City budget focuses on innovation, finding new ways to generate revenue and supporting core services; foundational support that may not be as visible as major construction projects, but just as important. Council approved final budget requests on April 25, 2016 and set a 4.11 per cent increase. A tax rate of 4.11 per cent means the owner of a single-family home with an average assessed value of $501,410 will pay $1,861 for the municipal portion of their property taxes. A City property tax bill will also include other user fees such as curbside collection and levies for other taxing authorities (e.g. School District, Regional District of Central Okanagan, Library, Hospital and B.C. Assessment Authority). The increase is slightly lower than the 4.12 per cent increase approved by Council at the provisional budget deliberations in December 2015. The 2016 Financial Plan presents Council with responsible choices that follow through on [...] priorities while keeping property taxes and fees affordable. A corporate culture of innovation and continuous improvement continues to produce the highest value for citizens when delivering Council priorities. 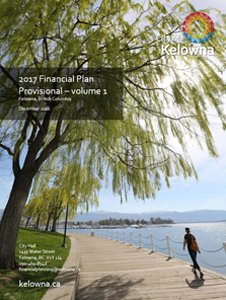 Based on the 2015 Financial Plan, Kelowna's property tax increase for 2015 is 3.2 per cent, an average increase of $55.42 for a Kelowna homeowner. With work beginning on the new Police Services building and Police contract cost increases, Protective Services will account for more than one-half of the tax demand in 2015: 1.77 per cent is for the new Police Services Building project and Police contract cost increases associated with indirect costs for pension and recruit training; and 1.43 per cent is for all other City operations and capital projects in 2015. Property taxes will provide $113.5 million of Kelowna's overall $477.3 million budget. Taxation makes up 24 per cent of total revenues. A total of $212.7 million will be invested in capital projects in 2015. The provisional 2014 Financial Plan sets an average municipal tax increase of 2.49 per cent. Property taxes will provide $107.9 million of Kelowna's overall $288.8 million budget. Taxation makes up 25 per cent of total revenues. A total of $44.5 million will be invested in capital projects in 2014.